In this entry I will share with you the details of my latest creation – “Jahepi’s Dungeon”. 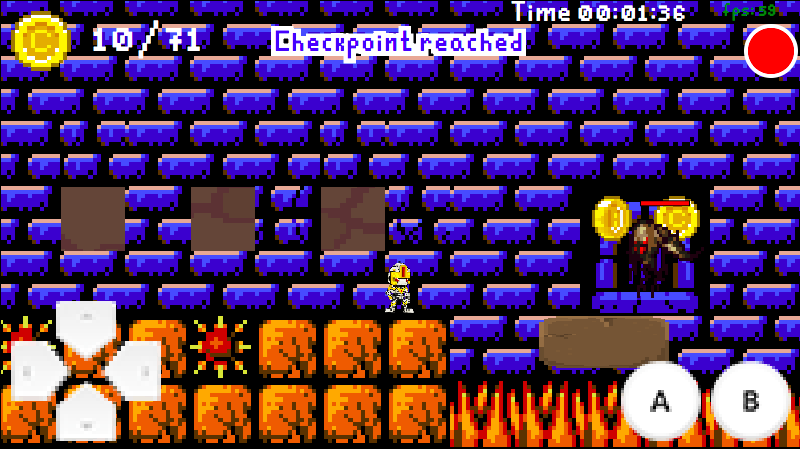 The Demo I created has a total of 3 levels that each has a set amount of gold coins you need to collect and a boss you need to defeat before passing the level. There are checkpoints in each level that will ease the frustration and agony you endure after falling into lavapits and getting slaughtered by each of the bosses. But do not be too scared! Our main character is a special kind of character that has unlimited lives. So even if you die a few hundred times, you are sure to beat the demo on the 501st try. After you load the game, you will be familiar with the layout. As a gamer, I am sure you have seen this type of layout a thousand times. The controller is a simple Left, Right, Up, Down, A, B. It is located at the bottom left of the screen so you can play with a mobile device. You can however use your keys on a keyboard if you are using a PC. Feel free to leave a comment if you have any ideas for a better layout on this sweet 2d scroller.